November 1, 2018 – Many coins graded by Numismatic Guaranty Corporation (NGC) are absolute numismatic rarities, of which there may only be a few specimens. They are veritable historical documents from the wallets of our ancestors. There are, in fact, everyday stories hidden behind those coins, but these regular numismatic items usually do not appear in history books. This year, the Certified Collectibles Group, which has affiliates for the certification of coins, banknotes, comics and stamps, recently expanded with a new affiliate. Collectibles Authentication Guaranty (CAG) preserves the provenance of collectibles associated with famous people, and it was launched with a sensational large-scale project: a collection of thousands of items from none other than the first man on the moon and his immediate family members. The incredible collection of historical memorabilia from the family of astronaut Neil Armstrong (called The Armstrong Family Collection) includes several thousand artifacts, including medals, correspondence, and even pieces of the famous airplane flown by the Wright Brothers, the famous US-based aviation pioneers. The first several hundred items from the collection will be auctioned on November 1-2 by Heritage Auctions. After Armstrong’s death in 2012, his family concluded, after careful consideration, that the collection had to be shared with friends and fans of the legendary astronaut. However, the Armstrong family faced a similar challenge to many other heirs: how to document and preserve the heritage and legacy of their famous father, even as the individual components find new owners as part of a large-scale and internationally renowned auction. This gold medal minted in 1969 in celebration of the 50th wedding anniversary of Armstrong’s mother. A 1969 Gold Medal shows Armstrong as “Der erste Mensch auf dem Mond” („First Man on the Moon”), with a fictitious face value of “50 Lunare.” The commemorative medal’s reverse contains the words “Das Erste Mondgeld” (“the first moon money”). It has a fine weight of about 7 grams. However, the background is much more exciting than the pure precious metal content: Armstrong presented this medal, which was minted in Germany, to his mother Viola for her 50th wedding anniversary – probably because of the number “50” on the medal. The medal was graded NGC PF 69 Ultra Cameo. A silver medal from 1989 which was also minted in Germany, commemorates the “20. Jahres-Tag der Mond-Landung” – the 20th anniversary of the moon landing. It shows Armstrong on the lunar surface on the obverse, while the reverse has the words „Die Eroberung des Weltraums durch den Menschen” (“The conquest of space through man”). The medal was graded NGC PF 67 Ultra Cameo. A 1972 bronze gilt medal shows a portrait of Armstrong, and was issued as a hiking medal at the 2nd International Donau-Lech meeting in 1972 in Genderkingen in the southern German region of Bavaria. The medal has a diameter of 44 millimeters and is attached to a red, white and blue ribbon. It was preserved in an oversized holder, similar to the ones used by NGC for large coins and medals. It is graded NGC MS 66. 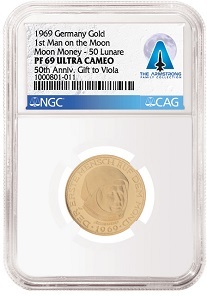 In addition to these three numismatic collectibles, all of which are graded by NGC and encapsulated in a sturdy, clear holder, the Armstrong Family Collection also contains numerous other lots with German roots, including a piece from a German zeppelin that crashed over England during the First World War. Armstrong also kept a memento from the first flight of the famous aircraft LZ-127, which is considered the first commercial trans-Atlantic zeppelin and operated until 1940. Other objects, which are not explicitly connected with Germany or Europe, will render any historically interested observer speechless: The auction includes some of the legendary Apollo Robbins Medals which were commissioned by the astronauts to take on all Apollo missions starting with Apollo 7. Important dates relating to the mission were engraved after the astronauts returned to Earth. The auction also contains Fliteline Medals, which were the predecessors to the Robbins Medals and flown on missions for the Gemini Program, the predecessor to Apollo. Other items that are available include a Boy Scout hat from Armstrong’s youth and flags that traveled aboard Apollo 11, including ones from the United States, several American states and the United Nations. The Heritage auction has about 700 lots with Armstrong Family Collection items in all price ranges, so even Armstrong fans on a modest budget have a chance to bid on a memento of their hero. And even without bidding, browsing the auction catalog is still an exciting adventure for any history buff. Author Sebastian Wieschowski has worked as an author with a focus on numismatics and precious metals since 2007. His articles have been published in magazines such as MuenzenRevue, MoneyTrend, Coin World and the Journal of East Asian Numismatics. He is the author of the Bullion Book and the Fake Coin Bible and a graduate of the School of Economic and Political Journalism in Cologne, Germany. For more information on this auction please visit the Heritage Auctions website. Further information on CAG and their services is available from their website.